Day 4 & 5: Apache, Sing and the Winner is…. We’ve got all the amazing details on the last couple of days of Olympics 2012, including the winners of sing and Olympics. A close race right until the end!!! Day 4: Apache! Jump on it! Jump on it! Jump on it! Morning activities started with Red Jesters in the lead and ended with Blue Royalty pulling in just a bit higher. This year really has us waiting until the very last moments of this competition. While camp spent the morning at their regular scheduled activities; basketball, soccer, ghost, gaga, tennis, and so forth, you could feel the excitement building for The Great Apache Relay. 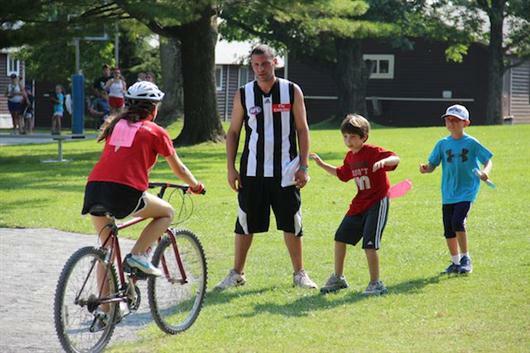 The Great Apache Relay is a camp-wide relay race that covers every inch of our Pocono home. 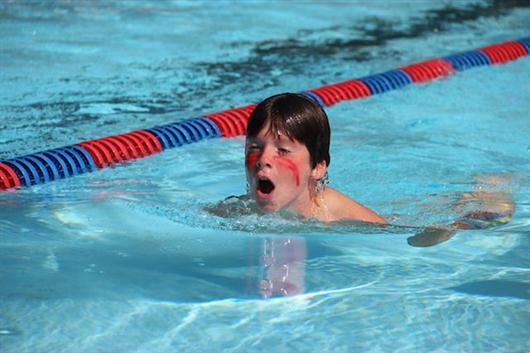 Every single camper participates in an event that can range from a lap around the track to swamping a canoe to whistling with crackers in your mouth! 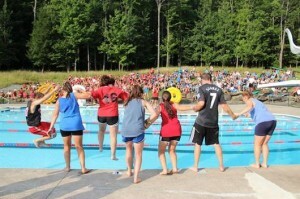 It is one of those rare moments where everyone in camp has the chance to work together towards one single outcome. At the final event, Fire Brigade (where campers shuttle two tiny cups of water across the field to fill two jugs), Red filled their jug first and the air horn sounded. Blue was a mere two minutes behind and everyone came out a winner. It certainly was one of the most exciting Apache’s in recent history. The waterfront is always a pleasure for spectators to watch the end of Apache with the various activities in the lake, kayaking, rowboat, sailing, canoeing and so on. The lead changed a several times over the 2 hour event while a rain storm in the distance loomed ahead of us. But the rain waited until we all got back to our bunks (which we think was very polite) and we all got a chance to rest a bit with sound of rain on the bunk roofs. It was a short storm and dinner went on as did Cumulative Long-Jump. Judgie Charlie Neisenbaum was on hand for the judging (he still holds the record for longest camper jump). The Jesters and the Royalty bring it to the concrete… Legs together, swing your arms for momentum, and JUMP! The day ended with Red Jester’s in the lead but the Blue not far behind. And then there was Day 5…. Day 5: Sh- Sh- We’re saving our voices for Sing! We have not lost our Olympic fever here yet! Have you? The day 5 morning was the strongest display of sportsmanship, comradeship and competition yet. 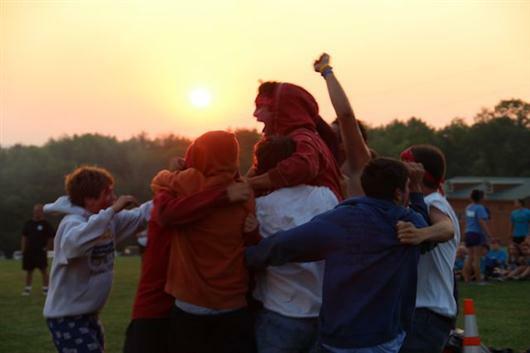 A very important shout-out to the Senior Boys, the 14 year olds and second oldest on boys camp, who embodied everything that Camp Towanda Olympics is about. While they had the competitive spirit, they were honest with the Judgie’s calls (even correcting points for the other teams at times), encouraging all their teammates, all the while playing an excellent game of volleyball. Their game really encompassed the general feel of this Olympics. All of the morning activities echoed these same principals and everyone felt the excitement building over the much anticipated Olympic Sing! We walked into sing with just about a 9 point spread in favor of the Red Jesters. What a night it was! The teams cheered, marched, sang, clapped and joked about the summer and our 5 Olympic days. Everyone looked regal as ever in their team colors and shirts as we our Towanda Olympics came to an end. Camp got the chance to look at the plaques that will decorate our walls for years to come as well honor campers with the special “Olympiad” award which celebrates representatives from each campus for their outstanding behavior in the past 5 days. Camp would also like to extend a very special congratulations to Matt Miller who was awarded with the “Big O Award”, which gives recognition to a Judge who has gone above and beyond to help make camp Olympics run smoothly. And now the moment that you have all been waiting for– Blue Royalty won sing by a very small margin, but in the end, The Red Jesters held court as the winners of 2012 Olympics. Congratulations Red Jesters!! Believe it if you can but there was only a 2.2 point difference!! We closed our night as a Camp Towanda family, watching the Dorm of 2012 sing their Alma Mater again for the last time. 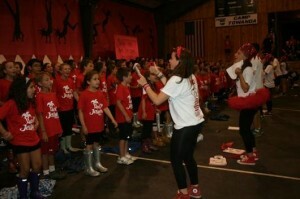 Then camp linked shoulders in a mish-mosh of red and blue to sing Friends, Alma Mater, and Taps before going to bed. We are all looking forward to a Lazy Day today! What a close and eventful Olympics to be a part of. We hope you have enjoyed our coverage. Our team is moving up to London tomorrow! *A special thanks to our our correspondent, Judgie Lauren Cohen who has been reporting from the field. Your blogs have been royally entertaining! Day 3: Build that Fire Higher Higher! D-A-Y T-H-R-E-E, that is how we spell DAY 3!!! Good Afternoon Red Fans, good afternoon Blue Fans!! Yesterday was another great day of spirit, friendly competition, and fun during the 2012 Camp Towanda Olympics. The morning started off strong with another track meet, this time on boys side. It was amazing to see how fast those legs could run. By the time the meet ended and lunch started, the score was closer than ever! Morning activities on girls side were just as exciting and made us realize how amazing these teams are! Just as the one team pulls in the lead, the other one comes up from behind. After a baked ziti lunch and a much earned rest hour, the sun settled in a cloudless sky–just in time for the girls swim meet and afternoon activities. Wishy-washy washy-wishy, all the girls can swim like fishies! Before the pinnacle evening activity, we took a pause from Olympics to have Friday Shabbat dinner as a camp family…the 2012 Dorm Girls lit the candles with the Dorm Girls of 2019 and 2020 (This years’ Debs)! A special moment in time! 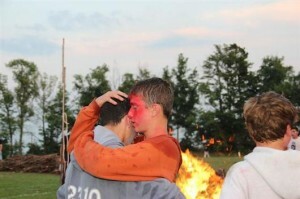 Rope Burning was last night and, as always, it brought all of camps’ hearts together. An alumni Guest Judgie crowd of over 60 judged and spectated the fired up crowd! Win, loose, or draw, Rope Burning is one of the most outstanding evenings to be a part of. Whether you are cheering on the side, passing down the wood, building the fire, judging or spectating, you can feel it–the sense of achievement and pride in your camp family. 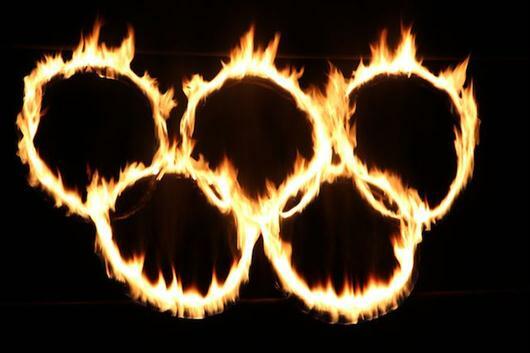 Maybe it was the size of the fires this year, or maybe it was the true Olympic spirit the seems to be radiating from the outside world into ours, but it was such an outstanding display of sportsmanship, teamwork, and determination. We are proud of both of our teams and extend a very special congratulations to the Red Jesters on their victory last night. Their fire was “no joke”! Both teams celebrated as if they won the FINAL 4 with milk and cookies and then ETB while counselors chiseled away at the scenery and team plaques for Sunday Night’s sing. Today is apache relay and tonite is the cumulative broadjump contest (which should be live on the Camp Cam!). We are doing our best getting you live coverage. Hopefully our blog, Facebook and CampMinder pics are filling in the gaps for you all at home! On a day when the lead in Olympics changed hands more than once – a pretty amazing thing in and of itself given that there have already been thousands of Olympic points awarded – and the evening concluded with a spectacularly thrilling rope burning, it was especially clear to me how fortunate I am to be both a Towanda parent and also an alumni Judgie. And today, more than ever, it was easy to see that one of the things which is most amazing about the way Olympics is conducted at Towanda is how naturally it teaches the kids the meaningful relationship between having a rich competitive spirit while at the same time maintaining the overriding importance of true sportsmanship. When looked at from a parent’s perspective, it’s easy to understand how instilling in the children this keen value of fairness will have a lifelong – and no doubt very positive – impact on so many of the relationships which they will form as they travel down life’s road. And what’s particularly special is how the kids so naturally learn this life lesson; it really is beautiful to see. Rope burning tonight was the perfect example of that. To have the entire red team cheer on the blue team after red had burned down their ropes in near record time was positively wonderful. 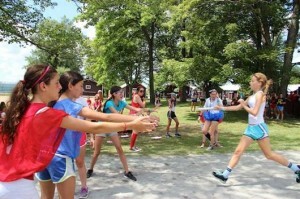 This sportmanship, this spirit, this remarkable demonstration of the bonds which are created and fostered at Towanda, all combine to create a powerful testament to the value of what’s being learned here at camp, and all while the kids are having the time of their lives. Lucky for them, and lucky for us. Day 2: Swim & Track Meets were a “Knockout”! Day 2 of Olympics could not have been more picture perfect! Glorious blue skies and sunshine set the stage for the day’s events, Girls’ Track Meet and Boys’ Swim Meet! After eggs and tots, an all campus clean-up (which was a judged event) and inspection, all the campers headed to their respective activities. The entire Girls’ side raced to the soccer pitch where the girls’ track meet was taking place. Tennis Robert sounded the horn and they were off! Girls’ Head Counselor Amy Miller took the mic, announcing all 58 races and events. The girls ran Marathons, 40-70 yard dashes, 1/2 laps, 1 laps, 2 laps, 4 x 1 relays, 4 x 1/2 relays, Potato Shuttles, Softball Throws and the big All-Star and Counselor Relays! The girls raced by the Judgies in flashes of RED and BLUE. 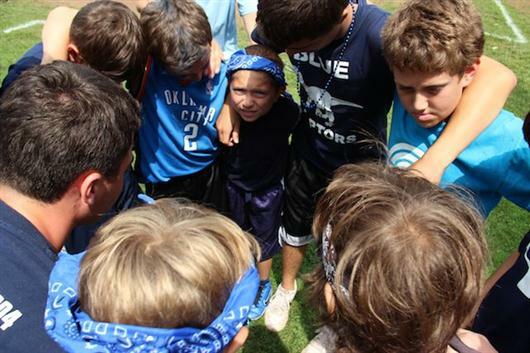 No matter the race, every camper finished with pride hearing their teams cheer them on! “We will we will attack on the track!”, “Come on Red, Beat Blue”, “Come on Blue, Beat Red” and so on and so on. LOTS OF CHEERING! The CCs, Generals and Counselors ran alongside their campers on the inner circle of the track helping them keep their stride to the finish line. While the campers ran a few great races, those CCs and Generals ran all 58! Now that is teamwork, commraderie and what the Olympics is all about! 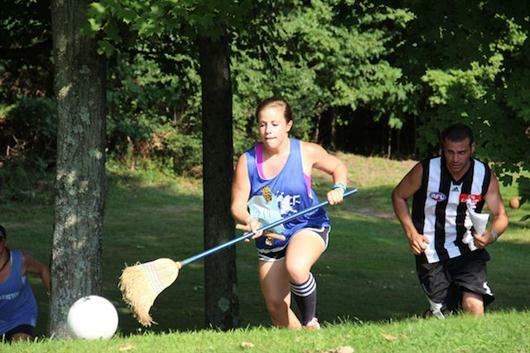 While the girls were running, the Jets/Cadets played Basketball, Middies Soccer, Juniors Team Handball, Inters and Nationals hit the GHOST court, the Seniors/Club Softball and an epic LITS Football game (best of the summer!). By mid-day it was time for American Pie bugle call for Mac & Cheese and a delicious salad bar (plus a Jonesy cookie or two!). Rest Hour was filled with tennis matches and rope burning wood collection for tonite’s big event, an LIT soccer game that ended in a shoot out, and CITs Ghost and Counselor Volleyball! All getting cheered on by their campers! In the afternoon, it was time for the Boys to hit the pool! They set up their cheering section on the hillside looking out at the lake. 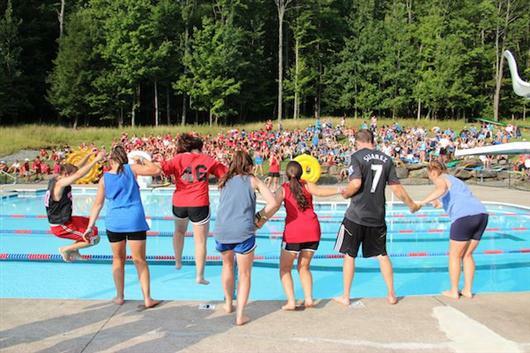 The waterfront looked incredible with the backdrop of blue and red shirts cheering on their teammates in the pool! No matter the race, breaststroke, freestyle, backstroke, relays or kickboard races, the teams wished each other luck and swam their hearts out! The brotherhood these kids feel for each other is so apparent and so strong. Even though they were racing against each other, there was so much respect amongst these friends, bunkmates, teammates and opponents. Most importantly, everyone (including the Judgies!) 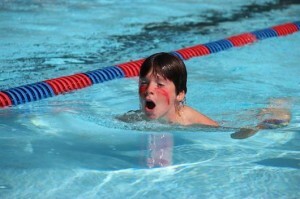 had a blast at the Swim Meet…all 55 races! While the boys swam, the Debs/Dillies kicked it at Kickball, Tweens dribbled away at Basketball, Juniors “called the ball (or it’s gonna fall”) at Newcombe, Inters and Nationals got to bust some ghosts at GHOST, Seniors had a go at Soccer, while the Dorm went gaga for Gaga. And the LITS topped it off with a great Softball game. Evening activity was Knockout!! 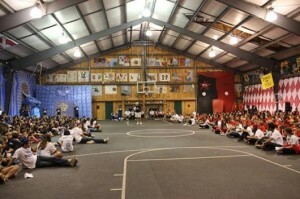 A Camp Towanda event held on all the basketball courts. Did all those campers realize that practicing Knockout all summer at Under The Lights would help them in this Olympic Event!? The night ended with our staff getting in on the games: Counselor soccer and KMP Ultimate Frisbee. Only 6 points separates the Red Jesters from the Blue Royalty. So what does that mean? The counselors did great splits; the coaches are doing their best; the kids are SO into it and the Judgies are making it happen! Stay tuned tomorrow for the Day 3 Olympic Daily Digest. Did you miss the Day 1 recap? Check it out here on the Blog: we challenge NBC for the best Olympic news coverage anywhere! As we head into tonite’s emotional and intense rope burning, we wish both teams the best of luck. We know it will be a memorable evening for everyone. Good luck Red Jesters. Good luck Blue Royalty. Day 1: What’s your favorite color? Day 1 of Olympics was off to a spirited start! Cheering has reached an all time high for the summer and is sure to continue over the next 5 days! Every event begins with the chant: “G-O-O-D-L-U-C-K we wish you all good luck today!” And is reciprocated by the other team with a chant of thanks. That sets the tone for the games and the amazing displays of sportsmanship we are seeing! 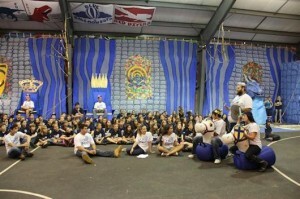 Although the camp is divided in red and blue, the campers are supporting all their friends and bunkmates. The Debs/Dillies, Middies, Juniors, co-ed LITS and Counselors (and Casper) all had the privilege of playing GHOST on Day 1! Mitch is holding court there with his expert team of Judgies and is in his glory! The Tweens had Newcombe (slide out and rotate! ), the Junior/Inter Girls and Dorm played great games of soccer (yes–one girl did play stopper wearing a blue tutu! )…if that’s not intimidation, what is!? Who needs the London Games, when you can watch riveting beach volleyball from the Senior Girls, Dorm, Club and LITS (future Misty Mays and Kerry Walshes here at Camp Towanda!). Jets and Cadets were pumped up at the Gaga court and were called up to the flagpole this morning! The National Girls and Inter Boys hit it out of the park at their respective Softball games and the Nationals and Senior Boys were in the [end]zone at Football! A full day of activities, rest hour tennis matches, wood collecting for rope burning (long sleeves and long pants), and more. Our American Pie bugle call rang at lunchtime…people still got chills remembering the breakout from the night before. It now takes on a whole new meaning! At dinner, each team got the microphone and had the floor. The Red Jesters pulled pranks. The Blue Royalty were prim and proper. The scores (so far) were announced and it was a 10 point spread between the teams!!! An even match. What will today bring? Last night was Tug-O-War on the soccer pitch! Intense match-ups and creative cheers and chants from each of the teams as they approached the rope. The final pulls were made by the Judgies vs. the Generals. Who do you think won? The teams retreated to practice their songs and team meetings before light out and taps. Today is the girls’ track and boys’ swim meets (where we are sure to see future Ryan Lochtes, Missy Franklins and Usain Bolts!). We are looking forward to hearing the sides cheering on their teams to the finish lines! Did we say everyone is cheering? “What’s your favorite color?” “A little birdie in a tree, said something very true to me”, “Thunder-thunderation”, “The team is in the huddle, the captain’s at the head”, “The cookie monster says”, “Split the V. Dot the I. Curve the C. T-O-R-Y. Victory victory let’s repeat it!”. Many alumni from all different generations have returned to step in as Judgies. It’s great to have them back at camp, outfitted with Judgies Olympic books, whistles and tradition! Day 2 is on! The sky is blue. It’s a perfect day for Olympics!!! Good luck Red Team. Good luck Blue Team. Red Jesters vs. Blue Royalty!!!! Okay check this out; all summer long we are working on this AMERICAN PIE video dub/synch. We are shooting scenes all around camp with everyone. We have kids kicking shoes off; we are driving chevys to levees; we are digging rhythm & blues; we sang dirges in the dark; even the parents sang along on Visiting Day! 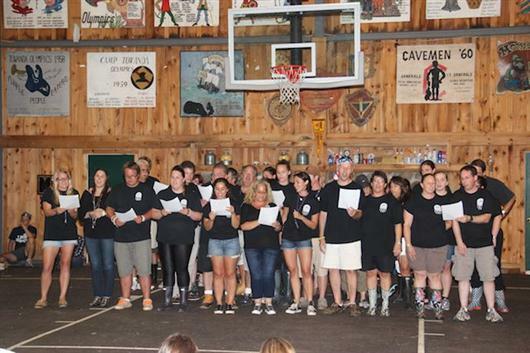 We wore red, white & blue or dressed in costume; everyone was into helping bring alive our traditional lunch time bugle call, Don McLean’s American Pie; celebrating 40 years since its debut and 20 years as a Camp Towanda lunchtime tradition! Throughout the summer, scenes, retakes and planning…of singing American Pie! In recent days, the tension, intensity, excitement and heart pounding edge-of-the seat wonder that included fakeouts, psych-outs, hints, drama and predictions flowed through every Towanda camper and counselor. Who are the Generals, what are the teams, what and when is Breakout???? Then last night’s AIRBANDS (our lip-synch extravaganza) was on! And it was awesome…over 14 acts of entertaining and humorous songs and skits! For the last act, we had to video one more time everyone in the amphitheater, wearing red, white and blue! Giant inflatable Uncle Sams, life size Statue of Liberty cutouts, dozens of Star Spangled beach balls, American Flags of all sizes filled the crowd! Off to the side was the Chevy, filled with even more patriotic paraphernalia. At which time a thunderous explosion of 10 minutes worth of red and blue firewooks rammed up into the sky from beyond the other side of the field house in just 10 seconds; while red and blue confetti exploded above everyone’s heads from the new lighting tower at the top of the amphitheater. The air horns sounded, the crowd went wild, screaming, huddling in support as the chevy drove in and the banners were unfurled on stage….. The RED JESTERS and THE BLUE ROYALTY was presented as the fluttering continued of the confetti. 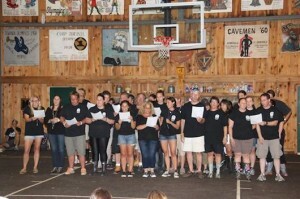 The Head JUDGIES announced the Generals, Camper Captains, Lieutenants and Sergeants. The crowd went wild. Cheers, applause and highly spirited support; Breakout of the 2012 Towanda Olympiad had begun. A quick team meeting, the opening ceremony with the lighting of the Olympic rings, staff meetings, Judgies meetings and taps. 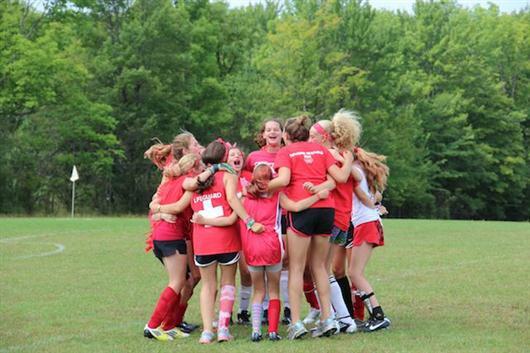 The early reports say it was a great breakout, emotional on many levels: the campers huddled and hugging each other, the adrenaline of pride and support and the overwhelming psyche for 5 days of fun, sportsmanship and competition; on all levels. I can’t wait for today’s activities to begin! I will be reffing GHOST matches for the next 5 days!!! Good luck red, good luck blue….